First Line: Eloise Montgomery had always believed that on the day that the worst thing happened, she would know. 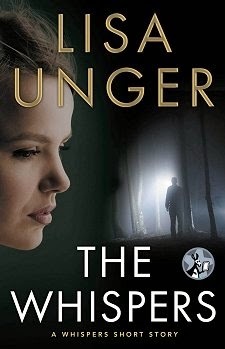 In the past author Lisa Unger has written two books set in The Hollows, a secluded town 100 miles outside New York City. Both books-- Fragile and Darkness, My Old Friend-- feature an ensemble cast, and Unger has long wanted to flesh out some of the characters living in this fictional town. First up is psychic Eloise Montgomery in "The Whispers," number one in a series of three digital short stories. Set in 1985, "The Whispers" tells us Eloise's backstory. Eloise, her husband, and two daughters were involved in a horrendous car crash that killed husband Alfie and oldest daughter Emily. Now she and Amanda have the seemingly insurmountable task of learning to cope with their loss and moving on. They aren't always successful. Eloise must also deal with a very strange side effect from her injuries in the car crash: she can hear whispers from the other side, and she feels uncontrollable urges to act on those whispers. She's not Super Sleuth or Wonder Psychic. She's a rather ordinary grieving widow and mother standing in the doorway of a strange new world-- and she thinks she's going crazy. She gathers as much information as she can from these whispers and contacts the authorities so they can do what they're trained for. Basking in the limelight from any success is the last thing she wants to do, and that one small detail endeared her to me. In a few short pages, Lisa Unger has created a very real mother and daughter who quickly engage a reader's interest and sympathy. This first digital short story sets up the following two perfectly, and I can't wait to read them. Moreover, since I had never read any of Unger's books before, I'm looking forward to reading them as well. Cathy - This look at relationships sounds very interesting. I'm not generally one for psychic visions, etc.. - not at all. But it sounds as though these are real characters, and that can make a big difference. Yes, the depth of the characterizations is what makes this story, Margot.